One of the things that is interesting about designing a kitchen is that it is usually the heart and soul of the project – a role it has always had. As the kitchen goes, so often goes the rest of the house – this is where technology interfaces with ambiance, and the outcome, always important, can be quite striking. As with the rest of our design approach our kitchen designs are primarily concerned with their functional role in both the larger and smaller scheme of things (their relationship to other rooms and to the appliances, cookware, and utensils). The aesthetics evolve out of the kitchen's form and function, although with a watchful eye on the rest of the house as well. 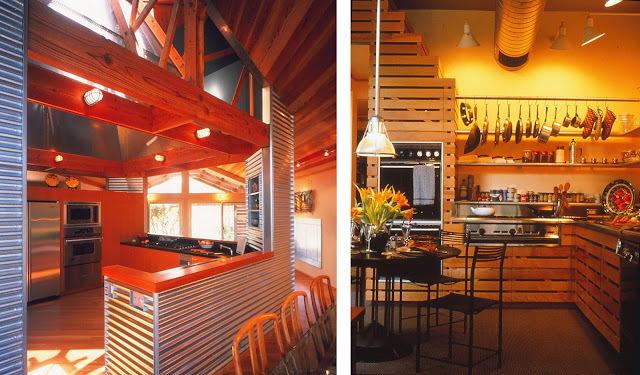 TIN ROOF: Here the kitchen is open to the rest of the house and is built around a large stainless steel island. A backup area holds appliances, walk-in pantry, sloped shelving, and additional counter space. Dish storage is in an antique hutch set into a wall of exposed 2x10 framing. HOWGUINNLAND: The awkwardness of the existing room layout led to relocating a new kitchen (rotated 45°) within an oversized living space to create more comfortable room scales. The kitchen is capped with a large pyramidal skylight which is in turn fitted with a light modulating cone of perforated sheet metal. Soft light filters down through the holes to illuminate the kitchen while the rest reflects into adjacent rooms as backlighting (4). SAN FRANCISCO REMODEL: The clients' indecision about open or closed kitchen cabinetry led to the embodiment of both – slatted faces of red birch (recalling the client's boyhood memories). The location at the back of an old Victorian necessitated exposing the exhaust duct which has subsequently been celebrated as a feature element (3).